now a dorm owned by UC Hastings. This 28-story, 1930 art deco tower on the corner of Leavenworth and McAllister is now a dorm for the U.C. Hastings College of Law. But it was built to be an unusual hybrid of Methodist Church combined with commercial skyscraper. In 1925, four Methodist Congregations got together to raise the $2 million budgeted for this project. They hired architect Timothy Pflueger, who had just completed two art deco masterpieces: the Telephone Building on New Montgomery and the Castro Theater. But just before construction was to start, the Methodists fired him and brought in Lewis Hobart to complete the project. Pflueger sued claiming they used his design without paying him. The court agreed, awarding Pflueger $38,000 in damages, about half of what he asked for. Despite these difficulties, the skyscraper was built in record time, opening in January 1930, just 18 months after groundbreaking. It was initially called the William Taylor Hotel, named for an early Methodist pioneer. The bottom half of the building contained a 500-room hotel which surrounded a 1500 seat church on the ground floor. Look for the gothic arches of the church which is now blocked off on the McAllister St side. The 14-floor tower contained 156 luxury apartments with custom-designed furniture, some with terraces. Gothic arches mark what was once the entrance to a 1500 seat church. By 1936, the Methodists were bankrupt and sold off the hotel which was renamed the Empire Hotel. The new owners wanted to add a bar but City regulations prohibited serving alcohol within 200 feet of a church. They ingeniously solved this problem by opening the Sky Room at the top of the 320-ft. tower in 1937. It was the first penthouse bar on the West Coast. Two years later, the Mark Hopkins hotel on Nob Hill converted its 19th floor penthouse into the Top of the Mark lounge. The Empire Hotel ran into union trouble in 1941. Then in 1942, the U.S. Treasury bought the hotel for $1.86 million and the Internal Revenue Service moved in. The U.S. Army took over the tower, including the Sky Room which became an office for the Army chiefs. The Army also bought all of the hotel’s furniture for use in the internment camps used to house Japanese-Americans during WWII. By the 1950s the Feds had declared the building surplus property. 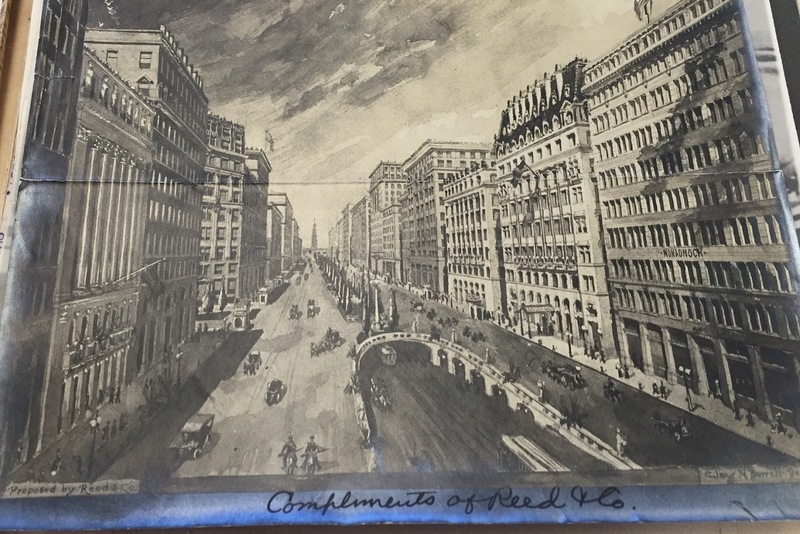 In 1977, when the new Federal Building opened down McAllister Street, they transferred ownership of the Empire to Hasting along with a $7 million HUD grant for remodeling. It opened as the College’s first dormitory in 1980. The building was the third church-skyscraper combo built by the Methodists. In 1924, the Methodists opened the 21-story Chicago Temple in downtown Chicago which is a combination cathedral, office building and hotel. And construction of their Broadway Temple at 173rd St in New York City, planned as 40 story hotel with a 2,000 seat cathedral tucked inside, began about the same time as the San Francisco project, but was stalled by the depression. A dramatically scaled back three-story cathedral was finally completed in 1952. Both the Chicago and New York Temples are still in use by the Methodists today. Exploring the Donohue Rare Book Room at the University of San Francisco, with help from librarian John Hawk, I cam across this long forgotten plan for Market Street. Sounds good to me – particularly the sanitary lavatory part. But how do the pedestrians get to that narrow strip of park in the center? And there was still the problem of how to handle the crush of ferry passengers (as many as 50,000 every day until the 1930s when the bridges opened) and load them onto the street cars. “. 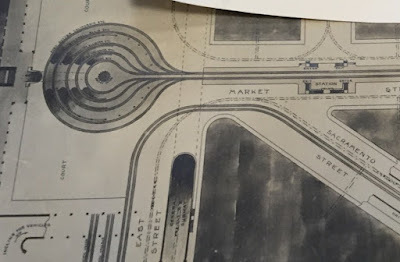 . . a number of large circular switches will be provided opposite the center entrance to the Ferry Building, with a dispatcher or switchman always in charge, who by the simple turning of a lever permits each car as it arrives to pass upon the proper switch and to stop only before a designated platform. This platform is reached by the passenger . . . without crossing the track . . . and is so constructed that it will be impossible for any passenger to take other than the right car. . .It can readily be seen that this arrangement will do away with all danger." The Reed & Co plan was ambitious for its time. It was ingenious and impractical and ultimately it was rejected. But the ideas in it weren't all crazy. Today BART and Muni trains run underground, while at street level there's wide sidewalks, decorative streetlamps and historic street cars. The city continues to experiment with ways to control traffic on Market to protect pedestrians and bicyclists. 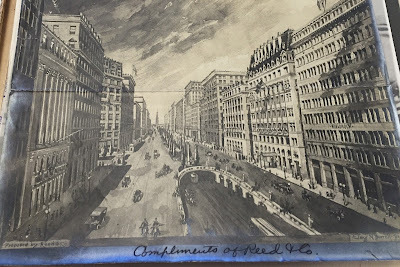 A hundred years later, we're still struggling to make San Francisco’s Market Street the grand boulevard it was designed to be. Photos used with permission of USF's Gleeson Library. Wells Fargo celebrates its 74th birthday today. Oddly, the company that has become closely identified with California and the West was founded by two men who rarely left New York. As young men, Henry Wells and William Fargo were express messengers in upstate New York. John Butterfield was a stagecoach driver. In 1850, Wells, Fargo and Butterfield became partners in a delivery company called American Express. Wells, a skilled dealmaker, was appointed president of American Exrpess. Fargo, the youngest of the partners became Secretary. Butterfield controlled the Board. Fargo, more aggressively competitive than his partners, frequently clashed with the older and more conservative Butterfield. In early 1852, Fargo developed a plan to deliver mail and small packages throughout the the west. Predictably, Butterfield opposed Fargo’s plan, and got the American Express board to vote it down. Fargo enlisted Henry Wells to raise money to back a new company. On March 18, 1852, Wells and Fargo met with a group of investors in an elegant New York hotel to form Wells, Fargo and Co. Both Wells and Fargo remained kept their positions in American Express while hiring others to develop their western venture. Each of them visited San Francisco only once -- neither had any love for the West. Wells crossed the Isthmus of Panama by mule to reach San Francisco in 1853, but only stayed three weeks before returning home. Fargo later served as mayor of Buffalo, New York. The Wells Fargo Museum at 420 Montgomery Street is holding a free birthday party today from 1-3 p.m.
Stagecoach at the Wells Fargo Musuem on Montgomery St.
Download the free City Explorer (tm) app and do walking tours of San Francisco when you want, at your own pace. You can even preview a neighborhood from home! Explore the city's history, art and architecture with fully-downloadable tours available on your smart phone or tablet. More info at www.cityexplorersf.com. I'm scheduled to lead the following City Guides tours. Please join me! POPOS are Privately Owned Public Open Space -- small gardens, galleries and other "secret" places throughout San Franciso's Financial District which can be difficult to find. All are open during business hours, most are closed evening and weekends. Contains locations and ratings for 68 POPOS downtown. Gloria Lenhart is a writer and amateur historian. She is the developer of the City Explorer San Francisco app for smartphones and tablets. She leads tours of San Francisco for SF City Guides and is available for private tours. Contact her at mysfpast@gmail.com. Follow her on Twitter @glenhart. Sign up here to receive new posts via email. We promise we'll never share your email address with anyone.